It’s tree planting time in the Rio Grande Valley. It’s cooler, the sun is not so strong, making November through February the best time to plant trees. During these cooler months, newly planted trees can concentrate on root growth and getting established and will then be ready to prosper with the spring rains. like ebony, anacua or mesquite, or a not-so-familiar tree such as brasil, or guayacán. 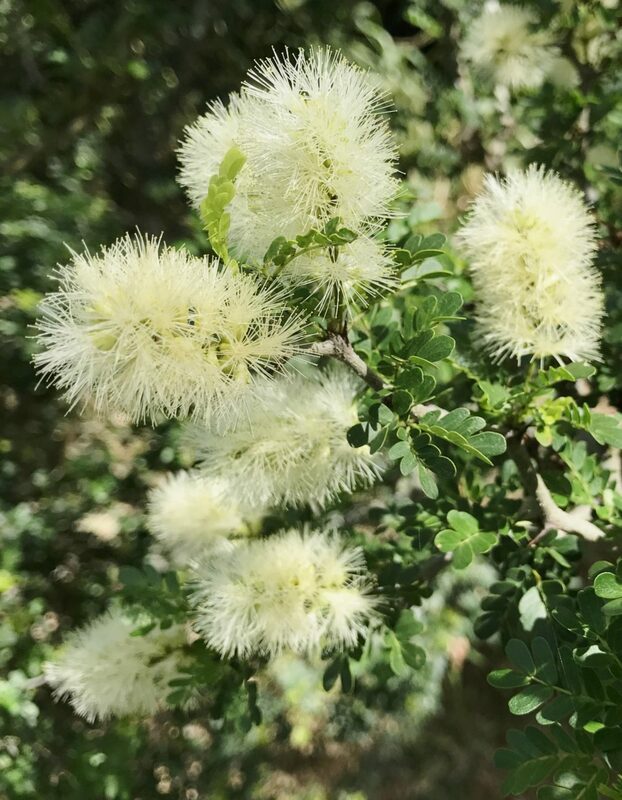 Any of these trees will benefit your yard and attract birds and butterflies — for your enjoyment as well as for the health of a native habitat. These five trees are stand-alone as they will eventually take up considerable space. In the meantime, native shrubs and plants can grow alongside the young tree. 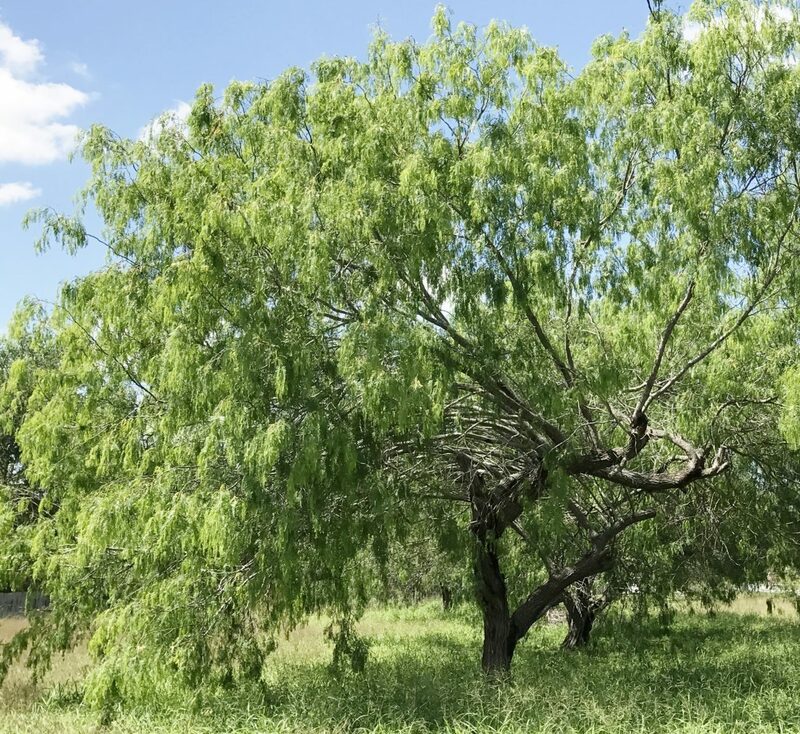 Texas Ebony (Chloroleucon ebano) can grow to 50 feet tall. It keeps its leaves all year and is a host plant to sulfur, blue and skipper butterflies. It provides great cover for wildlife and nesting sites for birds. Branches have paired spines. Anacua (Ehretia anacua) has a moderate growth rate and can reach 15 to 40 feet in height. Its dense canopy gives shelter and nesting for birds. Fragrant blooms in spring and after rain provide nectar for butterflies and bees and fruit for birds and critters. Honey mesquite (Prosopis glandulosa) generally grows to 20 to 30 feet. The tree’s crooked, sprawling growth patterns never fail to add an artistic element to the landscape. It flowers spring through summer. Young branches can have sharp thorns 3 inches long; older branches lose their thorns. A legume, it improves nitrogen in the soil where it grows. Mesquite trees are rela-tively fast-growing. Brasil (Condalia hookeri) is small, often reaching only to about 15 feet. 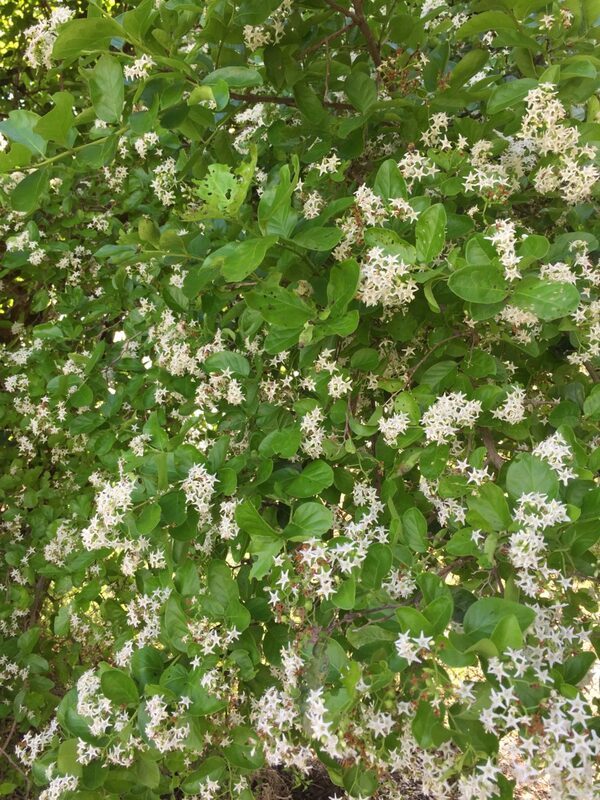 It has small, light green, spatulate leaves and a dense canopy. Branches end in a sharp spike. The tree offers good protection for roosting and nesting birds. Blooms summer and fall. Fruit is popular with wildlife. 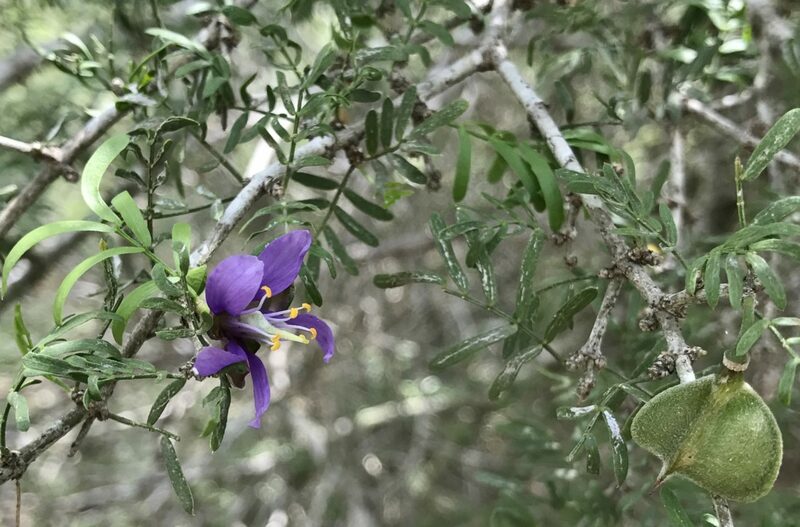 Guayacán, (Guaiacum angustifolium) also will define is own unique shape. This tree grows slowly and could eventually reach up to 20 feet. Lavender orchid-like flowers bloom in spring and after rain. Heart-shaped seed pods ripen to reveal bright-red fruit the size of a pinto bean. Guayacan provides excellent cover for wildlife and is host to lyside sulphur and gray hair-streak butterflies. 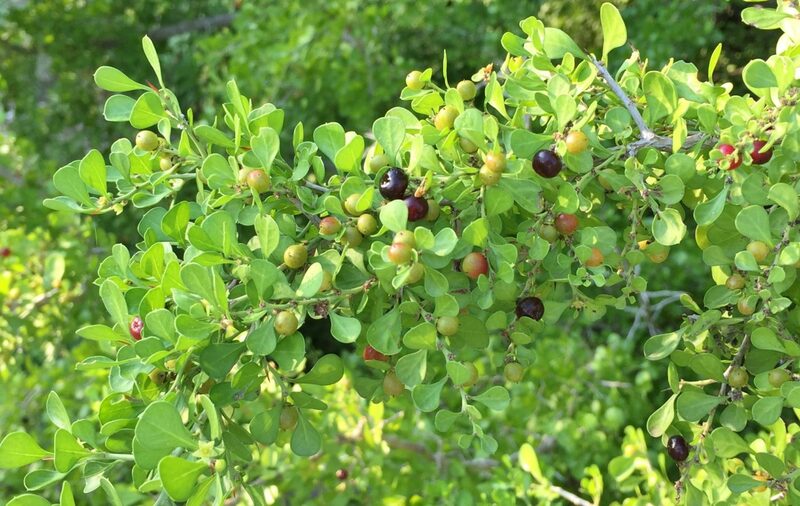 These are trees likely to be found in Deep South Texas’ native thorn-scrub forests. Once established, they are drought tolerant. When planting, free the roots so they can spread in all directions, especially if they have become pot-bound. Dig a hole twice the size of the pot. Flood the hole with water and let drain before planting the tree. After the hole has drained, plant the new tree at the height the soil level was when it was in the pot. Fill in around the sides with loose, friable soil or purchased compost or topsoil. Water in well and water two to three times a week for about the first three weeks to make sure the plant becomes established. Anita Westervelt is a Texas Master Naturalist and writes periodically for The Monitor.